‘French Classical’ is often used to describe ‘the other dressage’ – the alternative to the German ideology adopted by the FEI for selecting Olympic qualifiers. In practice, most of those who distinguish themselves from the German school in terms of methodology and ideals are typically training to a specifically Baucherist (not specifically French) ideal. While many prominent French masters of equitation have appreciated and followed the kind of equitation bearing the most resemblance to the origins of the art, this does not imply the origins are French. Not like the French-fry. Or, say, Disneyland. Ok, I’ll stop. The fact is ‘high school’ horsemanship truly emerged in Lusitania, roughly Iberia – or, if we must put a first country to it, Portugal – where horses of Iberian type (having for generations been bred for high collection and mobility) ultimately became admired and imitated by the emerging center of European aristocratic cultivation, Italy, where the high-born of most emerging European nations came to be sent for finishing during the Renaissance. Newcastle was arguably the first author to coherently assimilate and convey the essence of the techniques subsequently used to make non-Iberian (Spanish-type) horses move like Spanish horses as the result of a reasonably structured, repeatable program, which, if we follow his advice, still works quite well today (and yet we hear little of ‘English Classical’ dressage). Newcastle’s program was comprehensive, fundamentally gymnastic, and his object was collection and lightness. Considering the political annihilation of Francois Baucher by his countrymen of the era, modifying his system of dressage with the name of the nation which ultimately and officially rejected it is, well, at least complicated – if not unfair to the memory of this equestrian genius. La Gueriniere is considered the driving influence of “dressage” by proponents of both modern ‘French’ and ‘German’ interpretations of (French!) ‘dressage’. This is a problem, because these two schools of philosophy are diametrically opposed on several non-trivial questions – including the central notions of lightness vs appui, as well as their very precepts, priorities, and, subsequently, their associated training progressions. Therefore, without reading a single page of Gueriniere, we can reasonably conclude he is a poor basis of differentiating the schools. Both schools agree he describes a correct standard. And yet each school has subsequently developed a unique interpretation of La Gueriniere’s horsemanship. Thus, La Gueriniere has ipso facto been reduced to an equestrian Rorschach test (the very definition of “subjective”), versus an objective standard of “proper dressage”. D’Aure, though classically trained in Paris, was a proponent of “forward” equitation – a prominent feature of the outdoor and sporting equestrian activity for which he was well known. “Forward” is a central characteristic of German/competitive dressage du jour , where the extended trot has become signature. Forward-ness – in the context used today – is not a feature of classical dressage. The Comte D’Aure was well known to prefer sport riding such as cross country racing and hunting to the manege. He promoted vigorous forward movement, traction on the reins, and pushing the horse into the bit. It was the horsemanship he implemented at Saumur – arguably for pragmatic reasons, due the nature of cavalry horsemanship by his time. In any event, however, D’Aure was specifically and vehemently opposed to anything “Baucher”, since the two were bitter rivals – carefully avoiding one another socially. Moreover, D’Aure’s horsemanship is quite consistent with what would later emerge as the distinctly German school. So D’Aure is also unhelpful in distinguishing modern French and German dressage. What of Lotte, Beaudant, Kerbrech, and Decaprenty? All renowned high school horsemen. All excellent authors. And all French. But, to the man, all Baucherists. This leaves Baucher and Baucherism, whose methodology is a veritable inversion of the FEI’s (German) “training pyramid”. His manner ruthlessly pursued lightness and balance, and specifically avoided progressing from the training of one gait to the next until the preceding gait was – or could be – perfectly collected in lightness and balance. And here we have the characteristics which separate the notionally ‘French’ from the established German manner. Indeed, the Baucherized horse represents what we think we mean when we used the term “French classical” in the modern age. But how can Baucher’s dressage be “the French dressage” if France rejected it? I don’t mean socially. I mean officially. And if France did reject it, why should we attribute it to France generally? Baucher spent much of his career trying to persuade the French Army to adopt his view of “French Classical” dressage for the cavalry. But even after a highly publicized and highly successful pilot program demonstrating the effectiveness of his techniques in training cavalry, it was not adopted – in fact it would be prohibited at Saumur. His life’s work a failure, a new French government would take even his pension. Unbeknownst to Baucher, a British cavalry officer would later analyze various European training systems for horses and “men” , and recognize Baucher’s New Method as the most effective means of equine training. The US cavalry would later review this analysis and adopt it as best they understood it, and sans airs. And this explains why our own General George Custer may be presenting his mount perfectly ramene at the outset of the American Civil War. 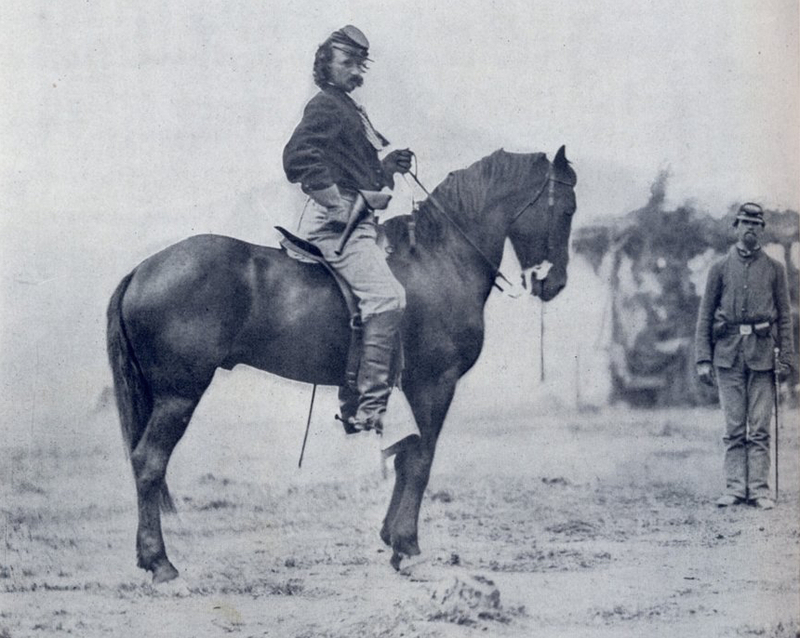 American Classical Dressage: General George Armstrong Custer, Baucherist. But Francois Baucher, rest his soul, died with very little to show for his revelations; dejected and rejected … by France. Only hereafter would the schools of French and German high school horsemanship materially diverge. So, for the same reason Christians in the US Bible Belt might take offense to the notion of being called “Roman Classical Spiritualists”, I think a more honest name for distinguishing modern German dressage from its alternative is, simply, “Baucherism”.